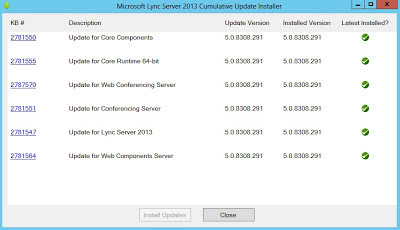 Update (CU2): With the release of Lync 2013 CU2 (July 2013) the upgrade process has changed from what is documented here. The new process in CU2 does not include the requirement to break the database mirror anymore. You do need to still ensure that the database servers are running on the Primary side before applying the Install-CsDatabase commands though. Please refer to the updated KB article here. There is a nice flow chart detailing the update process for front end servers here too. There are now additional steps involved when running cumulative updates on Lync 2013 pools that have mirrored SQL databases. So I thought I would go into some detail about this new process and show how my Database Manager Tool can be used as part of this procedure. This post specifically covers the process documented for Lync 2013 CU1 (Feb 2013), however, it's likely the process will be similar for future cumulative updates. So this post should continue to function as a reference in the future, but be sure to always check the process documented for the specific CU you are installing before doing an upgrade. 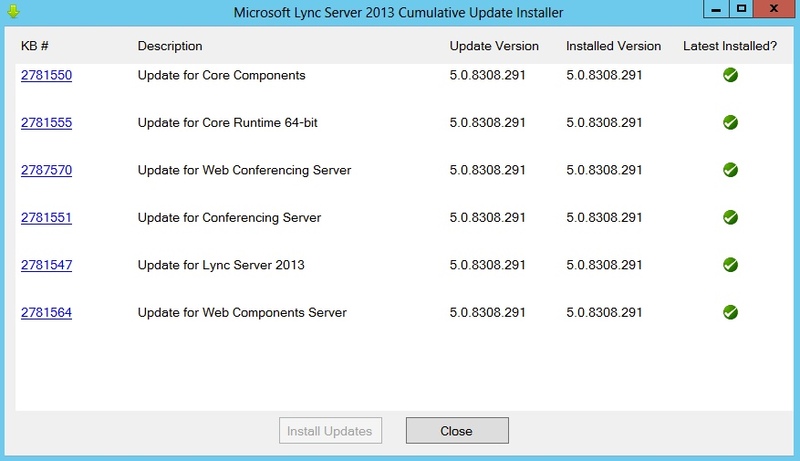 Download and install the updates all of the Lync Servers. Run the Update Installer on all Lync Servers. Check that all of the databases are running on the Primary SQL server. Uninstall (remove) the database mirror for the Application database type. Install the schema updates on the Primary database. Recreate the database mirror for the Application Database type. This will recreate the Application databases back on the mirror server. Check the status of the database to see that they are all running correctly. (Optional) If your Monitoring backend databases are on a different server, update them now. 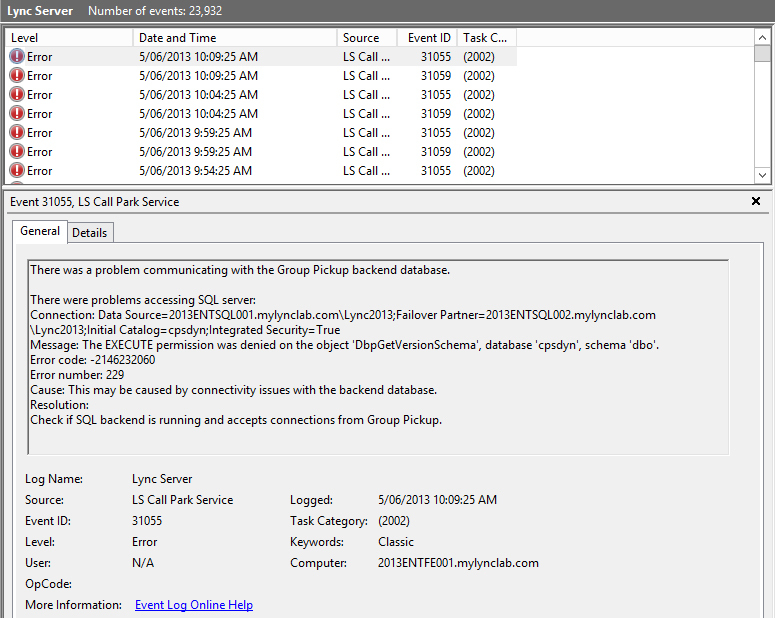 The above error states that “There was a problem communicating with the Group Pickup backend database” (Event ID 31055). This is because the CU1 release has added the new Group Pickup feature, which requires new schema additions in the Lync SQL databases for storing the data for this feature. When you’re not using mirrored databases this process is relatively simple, and can be achieved running one or two commands. However, when you’re using database mirroring there is a requirement to remove the mirror for specific databases that need to have the schema updated, and then re-create the mirror databases after the update has been applied to the primary database. 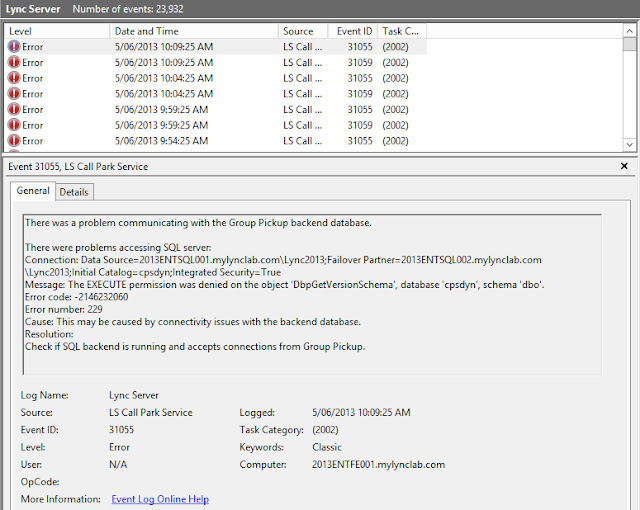 Note: The Lync 2013 Mirror Manager can be downloaded from here. 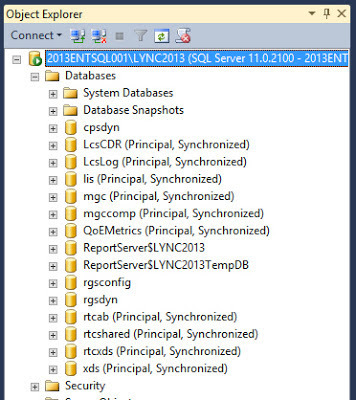 If you have databases that are showing up in the Secondary column of the tool, then it means that they are running on the secondary SQL server and need to be moved back onto the primary SQL server (if you're running a witness server these database may have changed over to the secondary server without your knowledge). 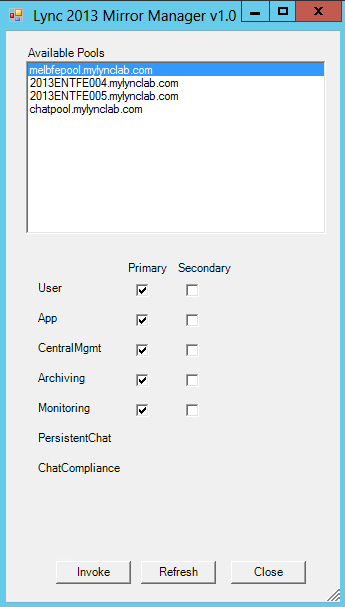 Move the databases back onto the primary simply by ticking all the check boxes in the Primary column and then click the Invokebutton. You will then be prompted in the Powershell window about changing the databases back to the Primary server. Type “y” as a response to these questions. 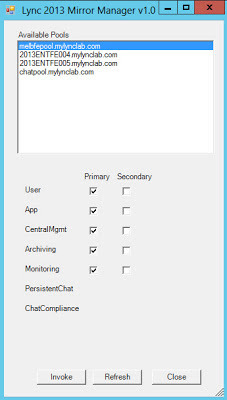 After this is complete the tool will update and the databases should all appear in the Primary column. Note: In the above example I haven’t checked the status of the Persistent Chat Databases. In the real world you should actually do this at this point. However, for the purposes of this example I haven’t done this to show what effect it has later when running the Database Install commands. We now need to remove the mirrored database configuration for the 'Application' database type. Note: In the future the need to remove the database mirror for other database types may become a requirement as well. So if you are coming to this post for a newer CU update, please refer to the specifics of the KB article relating to your specific CU release. the databases manually. Are you sure you want to proceed? VERBOSE: No changes were made to the Central Management Store. As can be seen above, the cpsdyn, rgsconfig, and rgsdyn databases (which make up the Application database type) have now had their mirror configuration removed (ie. There is no “Principal, Synchronized” state written next to them now). 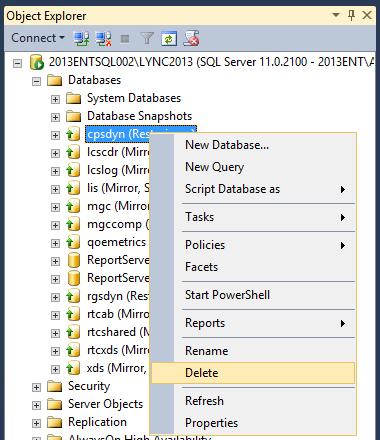 An important part of the command that we just ran was the “-DropExistingDatabasesOnMirror” switch, which tells Lync to delete these databases from the mirror server. Unfortunately, this function doesn't seem to always work, and databases can be left on the mirror server. So now we need to check the SQL instance on the Mirror server to see if these were deleted. NOTE: The error below can be caused by not having enough free disk space on the SQL servers. This is most likely to happen in a lab environment where you’ve only provisioned the minimum disk space for each machine. I had this happen with 15.3GB of disk space free, however, when I expanded the disk to have 29GB free this error went away. Install-CsDatabase : Command execution failed: Cannot find any suitable disks for database files. You must manually specify database paths. VERBOSE: Install databases required by Lync Server role(s). Checking state for database rtcxds. Checking state for database rtcshared. Checking state for database rtcab. Checking state for database rgsconfig. Checking state for database rgsdyn. Checking state for database cpsdyn. Checking state for database LcsLog. Checking state for database LcsCDR. Checking state for database QoEMetrics. Checking state for database mgc. Checking state for database mgccomp. Database created by script "BlobStore" already exists and is current. Database created by script "RtcSharedDatabase" already exists and is current. Database created by script "AbsDatabase" already exists and is current. Database created by script "RgsConfigDatabase" already exists and is current. Database created by script "RgsDynDatabase" already exists and is current. Creating database cpsdyn from scratch. Data File Path = C:\CsData\ApplicationStore\Lync2013\DbPath, Log File Path= C:\CsData\ApplicationStore\Lync2013\LogPath. Setting the database cpsdyn to single user mode. Database cpsdyn set to mode Single. Setting the database cpsdyn to restricted mode. Database cpsdyn set to mode Restricted. WARNING: Setting SQL Server Recover Interval to 5 mins. Setting owner for database cpsdyn to sa. 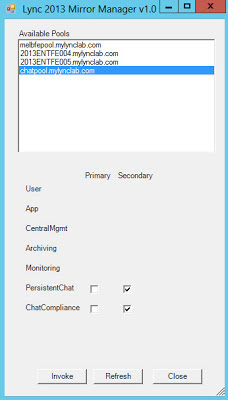 Adding account DOMAIN\RTCComponentUniversalServices to role ReadWriteRole. Adding account DOMAIN\RTCUniversalServerAdmins to role ReadWriteRole. Adding account DOMAIN\RTCUniversalReadOnlyAdmins to role ReadOnlyRole. Setting database version: Schema Version 1, Sproc Version 1, Update Version 2. Setting the database cpsdyn to multi user mode. Database cpsdyn is set to multi user mode. Database created by script "ArchivingDatabase" already exists and is current. Database created by script "MonitoringDatabase" already exists and is current. Database created by script "QoEMetricsDatabase" already exists and is current. State of database mgc is DbState_NotAccessible.
. Examine the product documentation for instructions. State of database mgccomp is DbState_NotAccessible. tion. Examine the product documentation for instructions. Performing operation "Invoke-CsDatabaseFailover" on Target "PersistentChatService". VERBOSE: "Install-CsDatabase" processing has completed successfully. Now our Application database schema has been updated and is ready to run all the new features of CU1. 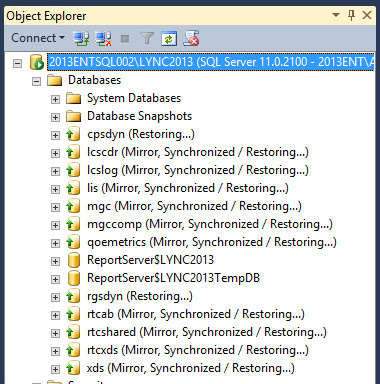 This cmdlet sets up mirroring for databases on primary SQL Server instance on the mirror SQL Server instance. If a witness is specified, it also sets up a witness for databases on the primary SQL Server instance. servers. Verify that WMI provider is running on all these servers. permission to create these folders. VERBOSE: Mirroring was configured successfully for database "rgsconfig". VERBOSE: Witness was configured successfully for database "rgsconfig". VERBOSE: Mirroring was configured successfully for database "rgsdyn". VERBOSE: Witness was configured successfully for database "rgsdyn". VERBOSE: Mirroring was configured successfully for database "cpsdyn". VERBOSE: Witness was configured successfully for database "cpsdyn". VERBOSE: Successfully created SQL Server Agent jobs on DOMAINSQL002.domain.com\Lync2013. VERBOSE: "Install-CsMirrorDatabase" processing has completed successfully. Note: If you get an RPC error at this point like the example I've provided below, it’s likely caused by ports being blocked on the Windows Firewall of the SQL servers. From the testing that I have done, I’ve found that the Ports that need to be open to avoid these errors are TCP 135, TCP 445 and TCP 49154-49155. This is in addition to the SQL Mirroring signalling ports that also need to be opened: TCP 5022 on the Primary and Secondary servers, and TCP 7022 on the Witness server (also the regular SQL ports UDP 1434, TCP 1433, and the Dynamic TCP port used when Named SQL database is used). Note: You could also do this check with the Mirror Manager Tool. However, just in case there is some edge case where the mirror has failed to re-establish (with an error I haven’t seen before), it’s probably best to use the command in this circumstance. VERBOSE: "Get-CsDatabaseMirrorState" processing has completed successfully. From the above output you will see that rgsconfig, rgsdyn, and cpsdyn are back in Principal state on the Primary server. Checking state for database xds. State of database xds is DbState_RequiresMinorUpgrade. Database xds set to mode Restricted. Dropping all procedures, functions and views from database xds. Setting owner for database xds to sa. Adding account DOMAIN\RTCUniversalReadOnlyAdmins to role ConsumerRole. Adding account DOMAIN\RTCUniversalConfigReplicator to role ReplicatorRole. Adding account DOMAIN\RTCUniversalServerAdmins to role PublisherRole. Setting database version: Schema Version 10, Sproc Version 13, Update Version 2. Setting the database xds to multi user mode. Database xds is set to multi user mode. Checking state for database lis. Database created by script "LisDatabase" already exists and is current. C:\Program Files\Common Files\Microsoft Lync Server 2013>"%ProgramFiles%\Microsoft Lync Server 2013\Deployment\Bootstrapper.exe"
Executing PowerShell command: Disable-CSComputer -Confirm:$false -Verbose -Report "C:\Users\Administrator.DOMAIN\AppData\Local\Temp\2\Disable-CSComputer-[2013_06_06][10_17_48].html"
Executing PowerShell command: Install-CSDatabase -Confirm:$false -Verbose -LocalDatabases -Report "C:\Users\Administrator.DOMAIN\AppData\Local\Temp\2\Install-CSDatabase-[2013_06_06][10_17_54].html"
This step will configure services, apply permissions, create firewall rules, etc. Executing PowerShell command: Enable-CSComputer -Confirm:$false -Verbose -Report "C:\Users\Administrator.DOMAIN\AppData\Local\Temp\2\Enable-CSComputer-[2013_06_06][10_18_28].html"
It’s safe to say that updating a Lync server with a Mirrored Database is a bit more involved than doing a single database server. It’s one of those processes that if taken lightly might cause you some grief in the real world. Hopefully this post will help to make your life a little easier.